Impossible, you say! Well, just about — but I think I have three options for you. A couple of days ago a Dog Jaunt reader posted a comment asking for help with her move to Hawaii — she’d worked out all the complicated vaccination and paperwork requirements, but dreaded putting her dog in the cargo hold, especially given the extreme difference in temperature between Denver and Honolulu. The Department of Agriculture does not have any regulation regarding where pets fly within the aircraft. It is totally up to each airline’s policy. The airline is required by law to bring all incoming animals directly from the plane to the Airport Animal Quarantine Holding Facility. That’s a hassle for the airlines, and nearly all of them have responded by banning dogs from in-cabin travel to Hawaii. Twenty-four airlines currently fly into Honolulu, the location of Hawaii’s quarantine facilities (if you’re flying to Hawaii with a dog, you need to fly into HNL). Two airlines are charter-only, four are only inter-island, and sixteen either forbid all pet dogs (Alaska), carry them only as cargo (Air Canada, Continental) or do not allow them in-cabin (Hawaiian, American, Delta, Northwest, United, U.S. Airways, Air New Zealand, Air Pacific, ANA, China Airlines, JAL, JetStar, Philippine Airlines, Qantas). Another choice — the last one I know about — is to join a private travel club like Dogtravel Company, which organizes pet-friendly charters around the world. I know nothing about the service beyond what I’ve read on its website, so I don’t have a review to offer you. It’s an intriguing idea, though. Be sure, of course, to double- and triple-check the WestJet and Korean Air options before you book. 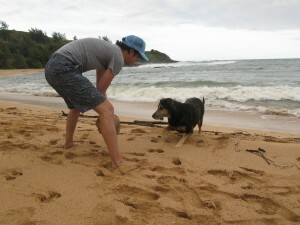 If you do take a dog in-cabin to Hawaii, please write and tell me about your experience — and if you know of another way to travel there with an in-cabin dog, please let me know! So very pet friendly of you to help out someone in need … good research! Thanks! It was fun — and I’m rethinking my no-go policy on Hawaii now! Westjet being one of only two airlines that allows in-cabin pet travel doesn’t really surprise me. Westjet is known as a very forward thinking company, especially for an airline. I haven’t flown with them in a while, but they used to tell cheezy jokes before take-off. Cheezy but in a cool kinda way. =) Aloha! This is great to know – it’s just another way to keep pets with their families during vacation or even long moves. Great article! Interesting article. I’ve been thinking about Hawaii because of the recent information that’s come out about the nature of their healthcare system (very good, very progressive). I wonder if it’s related to the strict regulations of what can be imported that you cite here. I know you only write about small dogs, and I’m assuming that the questioner who wanted to travel with a dog in the cabin had a pup that fell into that category, but it led me to wonder: Are size restrictions for cabin travel the same on all airlines that permit pets? Does it vary by the size of the carrier, not, say, the weight of the dog? Perhaps you’ve already blogged about this — if so, where? Hi, Edie! There’s really no rhyme or reason to the airlines’ size restrictions for in-cabin dogs. Take a look at the Dog Jaunt chart for U.S. airlines (http://www.dogjaunt.com/guides/us-airline-pet-policies/ ) and at my other blog’s chart for international airlines (http://www.pet-carrier-reviews.com/international-airline-policies-for-in-cabin-pets ) and you’ll see that maximum weights and maximum carrier sizes are all over the board. Southwest chose to take a different path and just post the size of its underseat space (http://www.dogjaunt.com/2009/08/southwest-airlines-publishes-under-seat-dimensions/ ). Clearly, I could talk your ear off about in-cabin pet carriers. Sorry — and thanks for the comment! Thanks for your thorough answer; really weird, interesting and useful information! on a credit card at the same time you send in your quarantine submission.